THE TIBETAN MASTIFF IS A FIERCE GUARDIAN OF HIS FAMILY AND FLOCK. HE IS MAJESTIC IN STATURE AND A LOYAL FRIEND. 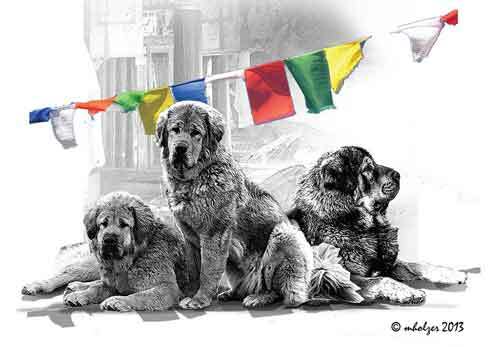 Legend has it that Tibetans believe that the souls of monks and nuns who weren’t worthy to be either humans or Shambhalas (the heavenly realm) have been reincarnated as these dogs. Perhaps this explains their high level of intelligence and loving nature. This breed is considered to be Royal as it belonged to Kings and Queens like King George IV, Queen Victoria and Genghis Khan who is believed to have 30,000 of these dogs when he was on his expedition to Western Europe. Highly intelligent with a mind of their own, the Tibetan Mastiff can sense danger very acutely. WELCOME! THIS SITE IS DEDICATED TO THIS VERY SPECiAL BREED.